Do you have a lord or lady of the house that would enjoy taking a look at what it’s like living in a castle during medieval times? If you answered yes, then this is the giveaway for you. Linda Ashman gives us a taste of the middle ages from many different perspectives. She uses good natured humor and rhyme. Check out TCBR’s full review here. 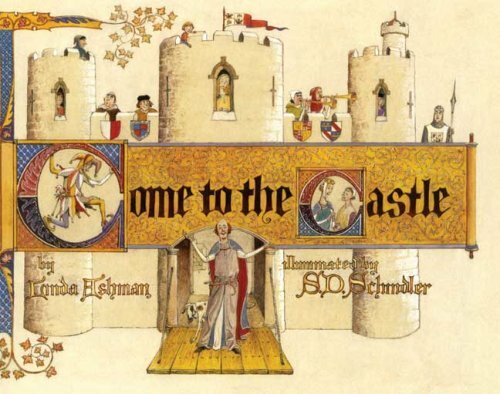 Thanks to the publisher of Come to the Castle: A Visit to a Castle in Thirteenth-Century England, Roaring Brook Press, I have five copies autographed by author Linda Ashman to give away to five individual lucky winners. Decide which of these characters best represents you: Earl, Steward, Herald, Lady, Cook, Cleaning Servant, Gong Farmer (who has the worst job), Knight, Suitor, Daughter, Jester or Doctor. Leave your answer in the comments field below. An extra entry will be given for each time you twitter about the giveaway and/or blog about it. Be sure to let me know if you do so by pasting a link in the comments section. Click here to follow me on Twitter. Don’t forget to leave me your contact information with your comment — a valid e-mail address is a must. Bloggers who have their e-mail address accessible on their blog profile need only sign-in before leaving a comment. The giveaway is open to U.S. and Canadian addresses only. The contest will run May 28th – June 1st, with the winners being drawn June 2nd. Winners will be picked at random using a random sequence generator (your comments are numbered in the order they are received and the numbers are like raffle tickets drawn from a hat). Winners have 72hrs to claim their prize. Unclaimed prizes will be awarded to an alternate winner. Disclaimer: Books will be shipped directly from Roaring Brook Press, delivery of the giveaway item lies solely on the sponsor. Names, e-mail address and physical addresses of all winners will be shared with Roaring Brook Press for the purpose of fulfillment of the giveaway. I have to be a Lady because I’m a girl and I neither cook nor clean. What a cool-looking book! Certainly not Gong Farmer! Herald sounds a bit like me. The Jester. No doubt about it. Ask anyone of my co-workers. I would be the Jester because I’m a bit zany and believe in the power of laughter! I would have to be the cleaning servant because I clean up after everyone all day long. Thanks for the giveaway! I have to agree with Cleaning Servant. I hope to be a Lady someday!!! I am most like the daughter. I think I would make a good Herald. The uniform would be fun to wear and I would get to travel to tournaments and the like. I’d say the Lady, for sure! I would be the Cook. Everyone says that I cook well and I enjoy cooking, too. Plus with 4 kids, I have to cook a lot. I’d be Cleaning Servant, for sure. I think that’s all I do . . . follow the guys around, cleaning up after them. I retweeted, but I have no idea how to get a link to a tweet. You should be able to view it in your @book_mommy section. I’m Bookfoolery. What a wonderful book. I don’t know any mom who doesn’t have a lord or lady in the house. I’d have to say I’m the jester, hiding my intelligence behind a joke 🙂 Thanks for offering these up. I already have the joy of following you on twitter. I would have to say the Jester! I am the “lady”. I rule the castle!! Thanks for the great giveaway! Well, today I would have to say cleaning servant. Ooh, the lady of course! This looks like a great book! I am the cleaning servant LOL! I really enjoyed this book. And yes, I enjoyed saying “Gong Farmer.” However, I would make a terrible Gong Farmer because of all the gagging I’d do. Who knows, though, maybe I’d get used to it and start bragging about how the Gong Farmer was the true Master of the House. This is a most generous giveaway, and I thank you for hosting it. I feel like the Cleaning Servant at the moment, scurrying around after my children. I’d rather be the the jester, playing instruments and just entertaining the party! I’ve been dying to get a look at this book- Linda Ashman is a terrific writer. a meaty head of boar! I think I must be the cleaning lady… feels like it in my house, anyway! I’m always picking up after my boys. The Cleaning Servant (with a touch of the Jester) for sure. Um, I’d like to apply for a promotion to Lady, though? As a mother of three boys, I am going with the cook. They are always asking for more food! I think the cook would have the worst job because if the food isn’t tasty…off with your head!